Trump has consistently received backlash for his populist, protectionist, and nationalist policies, by the world liberals. He has even been polled as the least popular US President in the history of modern opinion polls. His lack of experience in administration and politics has gone heavily against him. Figures have always spoken badly for him. While 64% Americans rated for Barack Obama that they had confidence in him to do the right thing when it came to international affairs, only 22% showed confidence in Trump on the same parameters. Actually, majority of voters have shown low opinions of his character and competence. However, the question is: has this affected Trump? Not really, as he has continued with his policies, statements and ideas as if oblivious of any critic’s or opponent’s existence. It has definitely given him an advantage too; he is able to show he has done something, as consistently focusing on corrections, he has been able to deliver finally. Actually, his wins are more than his losses, in any field, be it business, politics or his personal life. He has managed his businesses well, and according to March 2018 estimates by Forbes magazine, he is the world’s 766th richest person with a net worth of US$3.1 billion, and therefore one of the richest politicians in American history and the richest President of USA. He has even co-authored several books, including The Art of the Deal, owned the Miss Universe and Miss USA beauty pageants from 1996 to 2015, and produced & hosted the reality television show The Apprentice from 2003 to 2015. Before becoming a Member of Parliament, or a Minister, you were a highly successful advocate, and used to farm with your father on your family land. What are your views on the current issue of farmers’ agitation? How has the government helped farmers as long-term solutions? Yes. I have been in the law profession for the last 38 years and am also a senior advocate practicing in High Courts and Supreme Court. It is true that I have worked for the causes of farmers. I come from a family of farmers. My father trained me into various aspects of farming while I was young and I have seen farming from close quarters. I can understand the agony of the farmers and can empathize with them because I see they have been wronged both in the pre- and post-British era. The present agitation by the farmers is the result of accumulation of injustices meted out to farmers due to wrong policies in the last 60 years which impoverished the farmer and weakened his economic condition to such an extent that he is not able to withstand even minor disruptions due to market pricing patterns or due to nature’s fury and calamities. There are hardly any surpluses left with him be it in the form of grains, fodder or even savings. To mitigate the problem of farmers, our PM Shri Narendra Modi Ji has taken the right steps in the direction of reducing cost of farming while at the same time doubling the income of the farmers in the coming years. The most important step has been to bring about a scheme by which the Government is assisting the farmer to determine the health of the soil, the outcome of which will determine the amount of manure or fertilizer that is required by the soil. Then there has been emphasis on use of Neem-coated Fertilizers as well as cheaper crop insurance through Pradhan Mantri Fasal Bima Yojana. To me, in the past misaligned incentives have resulted in the overuse of insecticides, pesticides and chemical fertilizers. This has resulted in soil degradation. The PM’s roadmap of doubling farmer’s incomes through use of technology, integrated agricultural markets (through e-NAM), organic manure, cheaper crop insurance and cheaper loan assistance are steps in the right direction and are being welcomed by the farming community. You have worked a lot for girl child education in Pali district, Rajasthan and generally in the country. Your wife has also helped you in this cause. Do you think women empowerment needs to be done politically, socially and financially at the same time? Please share with us what all you have been doing for girl child education and women empowerment. Yes, my wife has been very active in the field of women empowerment and girl education. Women empowerment is the need of the hour. An empowered woman means an empowered family. And yes, as you rightly pointed out, this empowerment has to be multifaceted. Politically, you need to create an environment where more women enter politics and take policy decisions in the interest of the society. To make them socially empowered, you need to reduce their working time in the kitchens, provide clean toilets at homes and proper sanitation measures, thereby giving them a clean and healthy environment. To support the higher education of girls from rural areas, we need to provide safe and quality hostels for them in urban areas. Financially we need to focus on giving them low-cost insurance schemes, essential work skills and better and safe work environments. I am confident that our Prime Minister’s sincere efforts in introducing well-thought-out schemes such as Sukanya Samriddhi Yojana, Beti Bachao Beti Padhao, etc. will create the kind of environment that is beneficial for the betterment of our society in the long run. I have taken the initiative ever since I have become an MP to provide insurance cover under Pradhan Mantri Suraksha Bima Yojana (PMSBY) for 1,31,175 (One lakh thirty-one thousand one hundred seventy five) women of my Lok Sabha constituency, Pali, from my own salary. Please share with us some of your inspiring experiences as a Minister in the government. I have developed a strong work ethic during my 38 years of law practice. After becoming a Minister, I spend a major chunk of my time in office be it in Shastri Bhawan or Electronics Niketan. Even my personal staff has now understood my habits and works with me late hours. I am encouraged by the motivation of my staff. They are enthusiastic about the work they do and the ideas that the Government wants to implement. Earlier this year, when I got a chance to interact with the scientists working in the Ministry in the field of nanotechnology, I was extremely delighted to see their enthusiasm and commitment for undertaking pathbreaking research in the niche field. I was convinced that with such a set of dedicated scientists at work, we shall surely attain Hon’ble PM’s dream of creating a New India by the year 2022. As the Union Minister of State, Ministry of Law and Justice, and Ministry of Electronics and Information Technology, please share with us the several development works your Ministries are conducting. In the Ministry of Electronics & IT, we are working on ensuring that Digital India programme of the Government achieves its objectives and transforms India into a digital economy. While at one end, we are enrolling people for Aadhaar, on the other we are encouraging them to open bank accounts, link them with Aadhaar and use it to receive Direct Benefit Transfer (DBT) from the Government as well as move towards digital payments. At the same time, we have launched schemes to promote digital literacy such as PMGDISHA. We are also working towards promoting growth of electronics manufacturing in the country as well as promoting start-ups in the Electronics & IT Space. We are also promoting adoption of technology in the education and health sector across the country. Recently, we had a conference with the industry captains on how to make India a Trillion Dollar Digital Economy and everyone was unanimous that this is too small a target if we continue to formulate and implement industry-friendly policies. In the Ministry of Law & Justice, our focus is on ensuring that vacancies of judges in the higher judiciary are filled at the earliest so to provide timely justice to the people and to reduce pendency of cases in the courts. We are also working on laws, which are the main cause of pendency of cases in courts. We have already repealed around 1,200 obsolete laws. We are also working on promoting alternate dispute resolution mechanisms to ease the burden of courts and to reduce tortuous litigation. Then there is the focus on providing technology in the courtrooms to make it easier for people to interact with the judicial process and reduce the time of litigation. You are known to be a very grounded political leader. What is your source of inspiration and who is your role model? I thank you for your remarks! I try my level best to help the people and when in doubt I seek guidance from my seniors and elders. My parents have been the biggest source of inspiration for me during school and college days. I have had to work very hard alongside my father to make both ends meet. It is hard to forget tilling the soil by using oxen and reaping the harvest in the blazing hot sun in Rajasthan. This instilled in me the importance of hard work, which has helped me in my career as a lawyer and now as a Minister. I am also inspired by the teachings of Swami Vivekanand for he brought spirituality in the realm of modernity in India. He made us realize our cultural and traditional roots and the richness of our heritage. Role models, there are many. Presently it is our Prime Minister who continues to inspire me. While I was doing fine in my legal profession all these years, I always had an urge to do something for my country. However, I was always held back by the thought that common people like me with only hard work and legal experience as their forte stood no chance in a system that rewarded the corrupt irrespective of their capabilities. However, inspired by the clarion call of Shri Narendra Modi Ji to provide a clean and transparent governance for the betterment of the country, I decided to take a plunge in politics. I was surprised by the trust Modi Ji has generated amongst our citizens. I witnessed it from close quarters when people voted me over my competitors by over 4 lakh votes in the 2014 General Elections. You are the Chairperson of the Joint Parliamentary Committee on Offices of Profit, and a Member of many other important Committees. What is the role of such Committees? The work done by the Parliament in modern times is not only varied in nature, but considerable in volume. The time at its disposal is limited. It cannot, therefore, give close consideration to all the legislative, and other, matters that come up before it. A good deal of its business is, therefore, transacted by these Parliamentary Committees. These Committees examine draft Bills as well as the issues assigned to them in great detail, bring together all the stakeholders, assimilate their feedback and advise on the Bills and policy decisions of the Executive. While it is the final product such as an Act or a policy decision that gets greater publicity amongst the public, as it affects the lives of the people directly, the Committees are the ones which would have worked overboard to assist the Parliament and the Executive to get to the final product. These Committees are great tools of the Parliamentary system of functioning. As Chairperson of the Joint Parliamentary Committee on Office of Profit, I, along with other members, did a large amount of work. We examined almost all the Ministries and Departments of the Central Government and reviewed four States. I was in the Committee for around two years, and it has been a satisfying piece of work for me as well as a great learning experience about the functioning of the parliamentary system in India. You have been associated with the Rashtriya Swayamsevak Sangh (RSS) since the age of eight. RSS has both a positive and a negative image in the minds of people. The reason is that people have created their own images based on certain factors. However, if you have to explain RSS and its ideology to the general public, how would you do it? Yes. I have been associated with RSS since my childhood days as a Bal Sewak. And I must say with my experience that this association has given me a grounding and pride in our cultural tradition and heritage. I do not feel that RSS can have negative image. It has been working since its genesis for the betterment of our society at the grassroots level sans discrimination on the grounds of caste or religion. You will always find it at the forefront of social service whenever any natural calamity strikes our countrymen. To my mind, negativity towards RSS may stem from lack of awareness about its selfless work. How do you take success in your stride? What was the happiest and the most rewarding moment of your life? Success in any sphere means more responsibility and more work. Throughout my career as a lawyer and now as a Minister, I feel satisfied by the virtue of hard work itself. I am driven by bringing happiness to the poor, the downtrodden and to those who have lost hope from the system. You have to continuously toil with the single goal of betterment of lives of the people of the country. There have been many rewarding moments in the last three years. Be it providing insurance cover for women in my constituency, or ensuring effective installation of solar lights, which is undertaken through CSR initiatives across my Constituency. to each other’s territory. With the recent visit of His Highness Sheikh Mohammed bin Zayed, Crown Prince of Abu Dhabi and Deputy Supreme Commander of the Armed Forces, a lot is expected to propel the ties with India to a higher level. Though India and the UAE have had historical and close ties, no Indian Prime Minister had visited the Emirates in over three decades, the last one being by the then Prime Minister Late Indira Gandhi in 1981. It was August, 2015 when Mr. Narendra Modi became the first Indian Prime Minister to visit the UAE in 34 years and set in motion a chain of events that would broaden the bilateral ties beyond being just a business relationship. The strategic nature of the bilateral relationship between these two traditionally friendly countries can be clearly anticipated with the nature of deals recently inked under the government-to-government partnership. It’s also a partnership that New Delhi is pushing to move beyond just trade and people-to-people ties though this in no way undermines the role of the 2.5 million-strong Indian diaspora in the Emirates that sends valuable remittances home. The Security Corporation amongst the two nations can definitely not be blinded as after agreeing to elevate the relationship to a ‘comprehensive strategic partnership’ during Modi’s August 2015 visit to the UAE and looking ‘forward to the early signing of the Comprehensive Strategic Partnership Agreement’ during Sheikh Mohammed’s February 2016 visit to India, both sides moved to draw up and finalize a framework agreement which was recently signed by both. The countries seem to have clicked the right chord; with UAE focusing on knowledge based industries and with India emerging as world leaders in multiple sectors like space, agriculture, pharmaceuticals, bio-technology etc there is a wide scope of corporation in technology transfer, R&D and for joint ventures. India is the UAE’s largest trading partner, while the UAE is India’s third largest trading partner after China and the US. Trade between the two countries during 2014-15 was around $59 billion and UAE’s Jebel Ali Free Zone is home to more than 800 leading Indian companies. Today, there are many opportunities emerging as the oil-based Gulf states are focused on diversifying their economies. Countries in the region are estimated to be spending more than $4 trillion in developing economic infrastructure suitable for nurturing non-oil business activities. More importantly, Expo-2020, the world’s third largest global event after the Olympics, is going to be held in Dubai and will boost infrastructure-related activities in the UAE, opening opportunities for Indian investors. His Highness Sheikh Mohammed bin Zayed Al Nahyan, Crown Prince of Abu Dhabi and Deputy Supreme Commander of UAE Armed Forces, witnessed the exchange of the memorandums of understanding with Indian Prime Minister Narendra Modi at the sprawling Hyderabad House in the heart of the Indian capital New Delhi. This is the second visit in the past year and during this visit, everyone witnesses the presence of a tangible reflection of the common path the two nations have chosen to trend in making Middle East a region of peace. The two nations reject extremism and any link between religion and terrorism. They condemn efforts, MR. Navdeep Suri- Ambassador of India to the UAE Receiving an Honour including by States, to use religion to justify, support and sponsor terrorism against other countries. They also deplore efforts by countries to give religious and sectarian color to political issues and disputes, including in West and South Asia, and use terrorism to pursue their aims. In recent years, UAE, like Saudi Arabia, have embarked on a closer relationship with India on security and counter-terrorism in addition to growing business relations. Security experts who are keen observers of sub continental geopolitics say that the visit will further deepen the strategic partnership between India and the UAE. Clearly both countries seem eager to seize the opportunity to expand bilateral ties as they see growing synergies in a rapidly transforming world. The UAE has also enjoyed a tremendous respect in the comity of nations and played the role of mentor and diplomat. Its voice of reason for a small country resonated loudly in the forums of the world especially in the GCC and the Middle East where its leaders have been accepted as fair and balanced mediators. This credibility factor has a major influence in New Delhi and now that the UAE endorses India’s right to protect its borders as it did after the Uri attack the relationship takes on a more positive dimension. The 14 bilateral agreements signed during His Highness Sheikh Mohammed bin Zayed Al Nahyan’s three-day visit underscores the breadth of engagement that now exists between the two countries. Agreements were signed for cooperation in defense, cyber, space technology, trade and investment, energy, infrastructure, and agriculture, among others. The joint statement affirmed a commitment to a “comprehensive strategic partnership for the 21st century” and hoped to build on momentum from both Prime Minister Modi’s visit to the UAE in 2015 and Zayed’s visit to India through regular high-level exchanges between the two countries. In the overall realignment of its foreign policy goals, India sees it relations with UAE central to its coordinated strategy in international relations spanning, economic, political and strategic interests. Shaikh Mohammad’s visit comes at a time when the Indian economy is opening up more sectors to foreign investments and is seen as among the few bright spots in a world economy that is witnessing a slowdown. India’s economy is recovering strongly, the International Monetary Fund (IMF) has said in its latest assessment of global growth, bumping up the country’s growth forecast for the current and next year as it warned of subdued global growth that could fuel protectionism. deepen economic cooperation taking into consideration the development goals of the two countries during the summit’s opening day. Senior Indian diplomat Navdeep Singh Suri, the new Indian Ambassador to UAE is now playing a vital role in strengthening the relationship. The UAE is participating as a country partner of the summit for the first time along with 12 other countries. The ongoing edition was opened by H.E. Narendra Modi, Prime Minister of the Republic of India, with heads of state, leading government figures and experts set to discuss cooperative and investment opportunities in a number of areas, most notably manufacturing, innovation and technology, small and medium enterprises, renewable energy, and tourism, among others. During the summit’s opening session, H.E. Dr. bin Fahad emphasized the importance of the historic ties between the UAE and the Republic of India, which he said are driven by deep and strategic economic ties and common interests and visions in many development sectors. He also referred to their countries’ close social H.E. 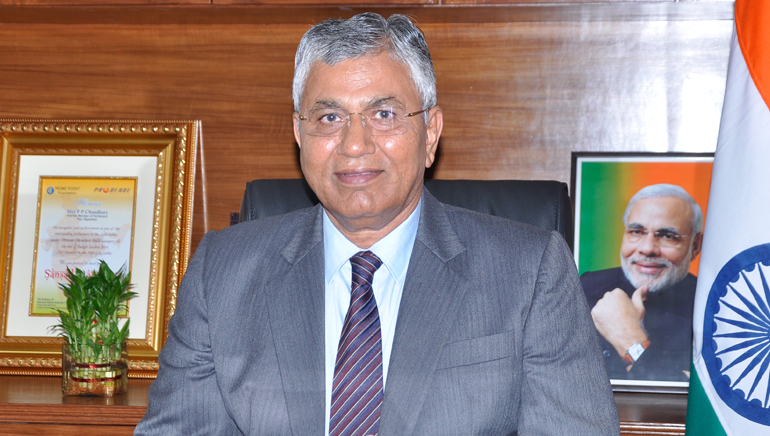 Dr. Ahmed Al Banna- UAE Ambassador to India and cultural bonds. URS-AsiaOne has been consistently highlighting the real people behind the world’s growth engines: People who work on the base, who create that platform which the rest of the world uses to build their structures – business, social and political. They are primus inter pares: other leaders look up to them for guidance and inspiration. Under AsiaOne’s Intellectual Property Right (IPR) – AsiaOne Global Asian of the Year (GAOY), we feature those who are exclusive, exceptional and extraordinary. The level of grandeur at GAOY is unparalleled. It emblazons only the supreme in the real sense. This is in addition to our World’s Greatest Brands & Leaders, Asia’s Greatest Brands & Leaders, and India’s Greatest Brands & Leaders IPRs! Of these, Education, Healthcare and Start-ups are flexible categories, which may be changed every year. How GAOY 2018 are Nominated? Leaders who have made the most impact in a year, and consequently have made the world a better place in the aftermath, are nominated as Global Asians of the year. They may also have made a similar impact within a region of their activities in their specific category. Thus, AsiaOne Global Asian of the Year is nominated annually and might be a newsmaker or generally highly admirable because of their highly innovative ideas, excellent business, political, or administrative acumen, or extraordinary contributions to the society – leaving an indelible mark in the process. The list of nominated AsiaOne Global Asian of the Year is painstakingly created after months of intense research conducted by our research team with active help from our editorial team. We have introduced an online poll for reader’s/people’s choice, and a certain weightage is given to their scores. We send the “List of Nominated AsiaOne Global Asian of the Year” to our top ten “India’s Greatest Leaders 2017-18 – Third Edition – Process Reviewers PricewaterhouseCoopers P.L.” held on 10th Sep 2018 at Taj Lands End Mumbai and top ten “World’s Greatest Leaders 2017-18 – Process Reviewers PricewaterhouseCoopers PL held on 9th May 2018 at J W Marriott Marquis Hotel Dubai for their advice on the selection. The advice of these eminent personalities is peremptory. 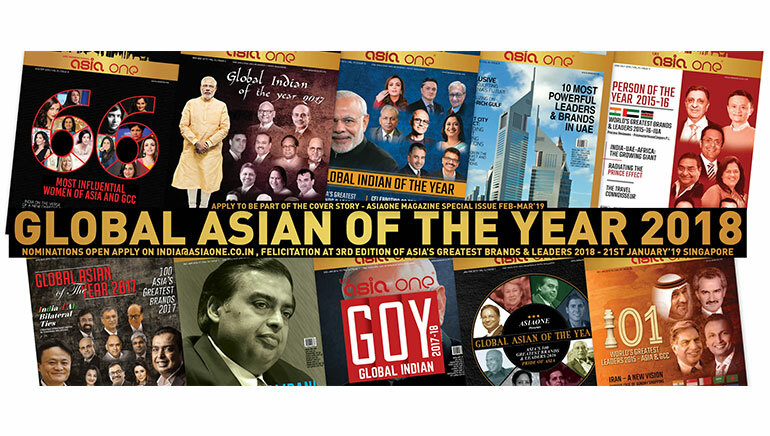 After taking into account the scores of readers, and advice of top ten India’s Greatest Leaders and top ten World’s Greatest Leaders, the final selection is made by the Chief Editor of AsiaOne. The greatest of all ways of conduct is being human or rather acting human and reaching out to those who need us the most. On one hand the corporate world is doing its bit in giving back to the society through its wide ambit of CSR initiatives and on the other is the realm of philanthropic organizations who have taken up varied ways of helping those in need. Benevolence is an intrinsic aspect of the human nature. The term ‘Benevolence’ has myriad denotations like warmth, friendliness, compassion, ordinary decency, fair play, kindness, altruism, generosity, and love. It simply means having good intentions towards living beings. A benevolent heart leans toward others; it is not neutral or indifferent and benevolence is the opposite of ill will, coldness, prejudice, cruelty, and aggression. It is a widely acknowledged fact that benevolence is extensively praised — from parents telling children to share their toys to saints preaching the Golden Rule — because it is the very premise of humanity. Benevolence curtails quarrels, builds trust, and is the bestodds strategy to get good treatment in return. Benevolence within and between nations promotes the rule of law, educates children, feeds the hungry, supports human rights, offers humanitarian aid, and works for peace and benevolence towards our planet tries to protect the endangered species and reduce global warming. The bottom-line is that benevolence is good for individuals, relationships, nations, and the world as a whole. The fact that benevolence is often enlightened self-interest makes it no less warm-hearted and virtuous. And at this time in history when individuals feel increasingly stressed and isolated, when relationships often stand on shaky ground, when international conflicts are fueled by dwindling resources and increasingly lethal weapons, and when humanity is dumping over 9 billion tons of carbon each year into the atmosphere (which is almost synonymous to throwing 5 billion cars a year up into the sky, most of which stay there) — benevolence is not just moral, it’s essential. Moreover, we cannot forget the fact that benevolence has buoyed us along as we all have been nurtured and protected by friends and family, humanity altogether, and the biosphere. Gazing out of the window and witnessing the grandeur of the “Land of Kings”- Rajasthan; The exciting sound of the train’s engine matches up with the heart beats when one heads towards this flamboyant realm of India to discover the immemorial heritage of Rajputana. The majestic forts, colorful bazaars, harmonically-rich music, glistening sand and the glorious legacy of kings and queens cast a mesmerizing spell on its visitors and leave them awestruck. Every place and every town has a unique culture which speaks through their attires, music festivals and cuisines. As a part of the Golden triangle that is an ultimate pilgrimage for travelers, Rajasthan gets a privilege of welcoming every third foreign tourist who comes to witness the wonders of India. On entering the royal gateway of Rajasthan itinerary, one gets the opportunity to witness the splendor of its capital city Jaipur. Its vibrant setting makes it look like a crown of Rajasthan. In this “Pink City”, one can still feel the gaze from the colourful veils glancing from the little crafted windows of the Hawa mahal. And the grand Amber fort stands tall with its majestic structure looking over the city since centuries. With its marvelous palaces and monuments, Udaipur, famous for its history, culture and scenic beauty is considered to be the ‘Venice of the East’. The Reflecting sunsets in the serene water of its lakes create a blissful aura that spreads tranquility in the soul and opens up the traveller’s senses. Moving ahead with your caravan through the lanes of the royal past, if you find yourself amidst a sea of blue rooftops then get introduced to the azure Jodhpur. Set on a rocky outcrop, this “Rhapsody in blue” has little beautiful homes and structures which look like a blue canvas reflecting the serenity of the skies above. Its Mehrangarh Fort, Umaid Bhavan Palace, Kaylana Lake and various other monuments and temples not only awestruck the beholder with their glittering artistry but also sing the valorous tales of the past. The Baoris of Bundi, scenic hamlets of Barmer, the Spiritual Shrines of Ajmer, the river safari of Chambal and the refreshing townscape of Mount Abu, the grandeur of Thar Desert in Jaisalmer- these are some of the maestros of the fascinating Rajasthan that take the visitors on a timetravelling journey. The famous haats such as Sadar Bazar, Kapraa Bazaar, Babu market, Bhattiyani Chohtta with their alluring wooden furniture, block print textiles, zari embroidered saris, captivating mojaris and jutis have the gravity to turn shopping into everyone’s hobby. Adorning jewellery from Jaipur, silver artifacts and paintings of Udaipur, vibrant embroideries of Barmer, Doria saris of Kota, Jodhpur’s attires- every city has a rich souk that caters the cultural vibrancy in their strikingly gorgeous articles. Rajasthan’s grand palette offers an ultimate feast. Be it Dal Baati and Churma, Missi Roti or the piquant curries, the epicurean cuisine leaves a person speechless. A perfect blend of Mewari, Marwari, Shekhawati, and Bikaneri cuisines, Rajasthan carves a special place in one’s appetite. Under the starry blanket of sky, Rajasthan’s rhythms sing a lullaby through their songs and traditional folk dances. Weaved for every emotion, moment or situation, these songs visualize the fables of wars, music of eternal love and the happiness and sorrows of the natives. They are the soul of the famous puppet shows. These are the communicatory strings that attach the contemporary Rajasthan with the glorious Rajputana. From the camel fair of pushkar to the literary fair of Jaipur, Rajasthan has it all. This majestic land sees a number of fairs and festivals that brighten up the spirits of the people. Every new month brings a plethora of celebrations with itself. Beginning the year with the colorful kite festival in January, the region beats the drum with festivals such as Desert Festival, Teej, Abhaneri, etc., and ends with Kolayat Fair in Kartik Poornima. The saffron “savera” reminisces the lovable itinerary of the previous day and brings forth a new dawn ready to inscribe a new page in the diary of a wander-lust traveller mesmerizing him with its colorful nature shrouded in the blue cities, golden structures, pink forts, yellow sands and green lushes painting the geography of Rajasthan and turning it into a rainbow.